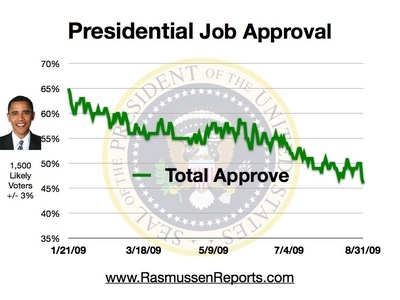 Rasmussen « America, You Asked For It! The message is clear Mr. President! But an Ivy League education must not have taught our Socialist President to read Tea leaves or poll numbers in free fall. He just doesn’t get the fact that Americans don’t want his Socialist dream for the US! Every time President Barack Hussein Obama goes on the offensive, his numbers plummet! 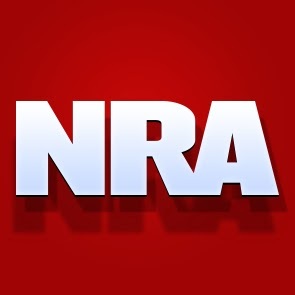 Keep talking Mr. President, you’re driving the nails in your own political coffin. Fifty-seven percent (57%) believe that passage of the proposed health care legislation will hurt the economy. Most people without our Socialist President’s Ivy League education understand that Americans just don’t want this level of government intrusion into our private lives. We don’t want a government that can seize control of property, businesses, or even entire industries at will. We don’t want our elected representatives to represent an Ivy League Socialist instead of their constituents. And we don’t want government to insert itself into the health care system and screw it up like it has the Social Security system, the Medicare System, the Post Office, Amtrak, etc.! It’s really pretty simple Mr. President. We just want you to leave us the Hell alone! Obama’s Health Care Summit Backfired! There’s little doubt our Socialist President, Barack Hussein Obama, hoped his health care summit would would change Americans’ minds. Remember? After lecturing us all summer last year on all the great things a Socialized system would do for us, Obama remained convinced we didn’t know enough about his planned government takeover of another 1/6 of the US economy. After the election of Republican Scott Brown to the Massachusetts Senate seat formerly occupied by Ted Kennedy, President Obama told us we just didn’t understand what he’s trying to do for (to?) us. So he decided it was up to him to educate us. Thursday, he did sit down. He did have his meeting. And the results weren’t what our narcissistic Socialist President envisioned. 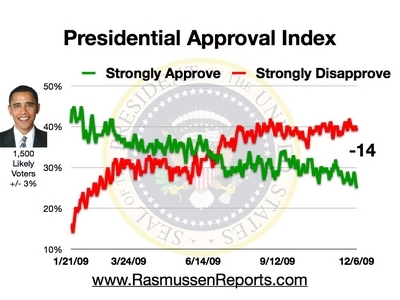 Yesterday, one day after Obama sat down with Republicans and Democrats, live on CSPAN, the Rasmussen Daily Presidential Tracking poll showed the President’s approval rating hit a new low. And today, it’s dipped even lower! Because this poll is based on a three-day rolling average with data collected nightly, two thirds of responses for today’s poll were collected after the televised summit. Even though Obama and Congressional Democrats were allowed more than twice as much time to make their case, this poll shows American voters don’t like and DON’T WANT Obamacare! Columnists and commentators from both ends and the middle of the political spectrum seemed to think Republicans landed the most punches in the match on Thursday and this poll confirms their initial calls. We the people are informed, we are educated, and we understand what Obama and his Socialist pals want. WE DON’T WANT OBAMA’S SOCIALIST SOLUTION! 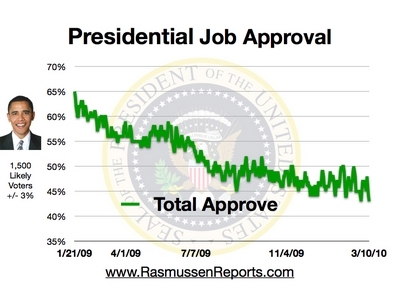 The number of likely voters who “Strongly Approve” of President Obama’s job performance to date has dipped to a new low. 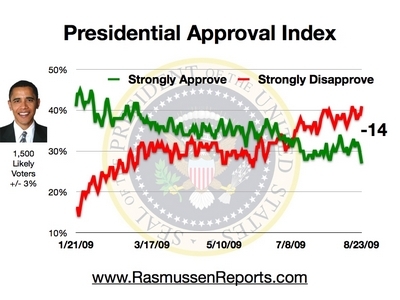 The Rasmussen Presidential Approval Index has remained in the negative double digits for the past three weeks and today stands at -14%, only one point off its all-time low of -15%. But, significantly, the percentage of respondents who “Strongly Approve” of the job Obama is doing has dipped to only 25% of likely voters. This is the lowest number of likely voters who remain staunch supporters of the President since his inauguration! Mr President, this isn’t the change Americans wanted! GOP Leadership in DC Still Doesn’t Get It! Last November the nation sent a strong and clear message to the Republican Party and Democrats found themselves in complete control of Washington. However, it appears the GOP leadership in our nation’s capitol couldn’t recognize a baseball bat if it hit them between the eyes! After everything that has transpired since January, Republican leaders still don’t realize conservatism IS what people want. In May, RINO (Republican in Name Only) Governor Charlie Crist of Florida was endorsed by National Republican Senatorial Committee. NRSC chairman John Cornyn said Crist is “more electable” than his conservative opponent Marco Rubio. It’s important to point out this was the first time the NRSC has endorsed a candidate who will be opposed in the Republican primary. Okay, in May Obama was still sailing in pretty calm seas. Most considered the April 15 Tea Party a one-time event and expected those protesters to crawl back to their cubicles and let the President get on with the Socialization of the American economy. But just this week, powerful Republican leaders in DC are trampling a real conservative and endorsing yet another RINO, Dede Scozzafava, in New York’s 23rd Congressional District. Michelle Malkin has a great piece explaining why she calls Scozzafava “an ACORN-friendly, union-pandering, tax-and-spend radical Republican.” And even though true conservative Republican Doug Hoffman is vying for the seat, the Democrat who calls herself a Republican has secured endorsements from such Republican heavy hitters as Newt Gingrich, Pete Sessions, and John Boehner. The GOP has the perfect opportunity to make huge gains in 2010, if it offers candidates who clearly differentiate themselves from their liberal challengers. But instead, these Republicans are playing right into the hands of the Democrats who have tripled the national debt, dramatically increased federal spending, and are seeking to put the government in control of the most personal and private decisions of every American. How can they not see this? Immediately following the 2008 defeat, much ink was spent explaining the failures that led to the overwhelming Democratic victory. Many liberals, including those in the mainstream media, were quick to pronounce the death of Conservatism, claiming the results signified a tsunami of Liberalism sweeping across the land. While some Republicans agreed, conservatives did not. According to conservatives, the GOP loss wasn’t a result of Republicans’ conservative policies, but the lack thereof. Though left-wing pundits and news outlets loved to paint President Bush and other Republicans as “too far to the right” for the past 8 years, the truth is Bush and the party abandoned key aspects of the conservative platform. Spending, debt, and the deficit, along with the size and scope of government escalated in spite of GOP promises to promote fiscal responsibility and limited government. In fact, Obama’s campaign strategy included promises to “return to” fiscally responsible policies and reduce the role of government in our personal lives. (The fact that he has already broken both of these promises is for another article.) So the Left’s hypothesis that Election 2008 was a repudiation of everything conservative won’t wash. But does evidence exist to support the idea that it was a lack of conservatism on the GOP’s part that cost it the election? The plethora of conservative grassroots activist organizations that began appearing online immediately following the election gave birth to a movement that has spread across the land, a mobilization of conservative activists previously unseen in these United States. Simultaneous rallies were held across the nation on April 15, July 4, and August 22, attended by Americans young and old protesting not only the hard left turn taken by the Obama administration, but the abandonment of the conservative platform principles mentioned above as well. Anyone who has attended these rallies can tell you the protesters aren’t calling for a return to the policies of President Bush, but a return to the conservative principles they believe made this country the greatest, most powerful, and most envied on Earth! 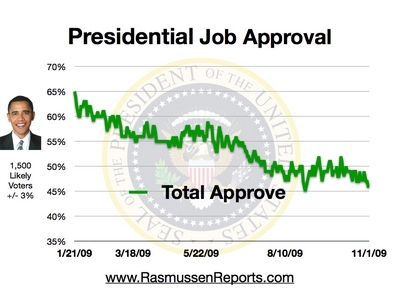 If that’s not enough evidence to convince you Americans want a return to conservative principles, take a look at Obama’s crashing poll numbers of late. Rasmussen’s latest Daily Presidential Tracking Poll shows the President’s approval ratings have dropped almost 20 points from their post-inaugural highs and a whopping 40% of Americans strongly disapprove of his job performance, up from 16% when he first took office. Another Rasmussen poll shows Americans prefer a generic Republican candidate to an unnamed Democratic candidate for congress by a 5 point margin. Republicans gained the edge in this poll in June after trailing Democrats for years, only 5 months after Obama began implementing his left wing agenda. So the question is, why can’t the Republican leadership understand? Why do they continue to promote, endorse, and patronize RINO’s when it’s plain to see this is exactly what has cost them the past two elections? Americans don’t need or want Republicans elected. They need and want Conservatives! The two should be synonymous, so Scozzafava should step aside and let a real conservative take this seat! To see the growing list of others calling for Scozzafava to withdraw, see Michelle Malkin’s post! Last week President Obama delivered his lie-laden speech to Congress in an effort to regain ground lost in his campaign for a government takeover of our nation’s health care system. Congressman Joe Wilson (R-SC) correctly pointed out the President’s lie that Obamacare wouldn’t cover illegal aliens, but was attacked by Democrats and the MSM for speaking the truth. The speech and the coordinated Democrat/media attack on Congressman Wilson seemed to have its intended effects for the first few days. But now things are falling back into place as the American people once again refuse to be deceived by the Democratic demagoguery of conservative Republicans who point out the truth about Obama’s bid to hand control of life and death decisions over to government bureaucrats. Following President Obama’s speech to Congress last week, support for his health care reform plan increased steadily to a peak of 51% yesterday. However, the bounce appears to be over. 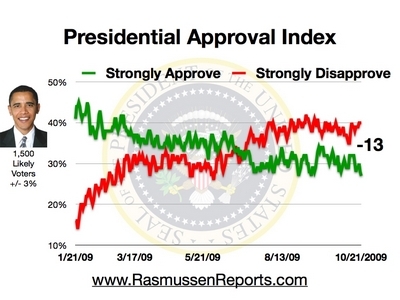 The latest daily tracking shows that support has fallen all the way back to pre-speech levels. Forty-five percent (45%) of all voters nationwide now favor the plan while 52% are opposed. A week ago, 44% supported the proposal and 53% were opposed. (see day-by-day numbers). The latest figures show that 23% Strongly Favor the plan and 41% are Strongly Opposed. The President can lie all he wants now. It appears the American people aren’t buying his bull anymore! Late last month, we indicated President Obama might help himself by backing off the health care debate. That was back when he was at the forefront, staging town hall meetings with planted questions from children of supporters. It was a little over a month after his ABC infomercial from the White House. It was around the time Democratic leaders in Congress were calling those of us who opposed the bill un-American and just before the White House asked supporters to turn in Obamacare opponents. Obama’s poll numbers showed a slight uptick when his administration floated a trial balloon for health care reform without a public option, but a threatened mutiny from his far left base quickly shot that down. He then went back to a full court press, insisting there would be a public option and introducing the idea of using the “nuclear option” (a procedural technique for getting around the need for 60 votes in the US Senate) for the first time. Basically he went from trying to sell his plan to telling Americans if they didn’t buy it, he’d cram it down their throats. No, the President didn’t drop back and punt. In fact, he didn’t drop back at all until last week when he took his family on a millionaire’s retreat on posh Martha’s Vineyard. With Obama in search of a “news free week,” health care almost dropped from the headlines. But it may have been too late. 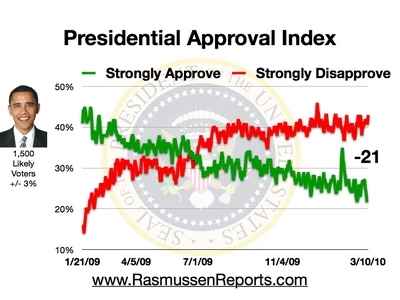 Yesterday, Rasmussen’s Daily Presidential Tracking Poll showed Obama with his lowest overall approval rating among likely voters since taking office. With only 46% supporting the President and 53% disapproving of the job he’s done thus far, one might infer the quiet period came too late. Americans have now recognized this man will lie without conscience to get what he wants. A majority of likely voters have finally realized Obama’s change wasn’t what they had in mind last November. 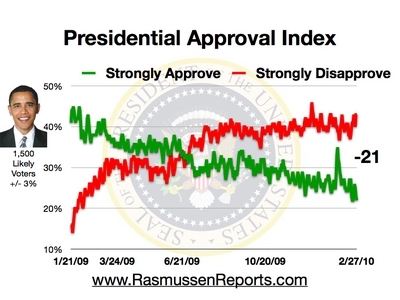 Rasmussen’s Presidential Approval Index has Obama hitting his lowest point ever today!